The Tories and DUP are plotting to use Brexit as an excuse to tamper with democracy in Scotland and Wales. Remember when the Brexit campaigners told us all that voting Leave would give the Tory party (and their uber-nationalist DUP mates) the pability to amend the powers of the Scottish parliament and the Welsh Assembly with no democratic oversight of their actions whatever? Well on the evening of December 12th 2017 the Tories and their DUP backers/puppet-masters joined forces to defeat Amendment 158 to the European Union (Withdrawal) Bill by 315 votes to 291. 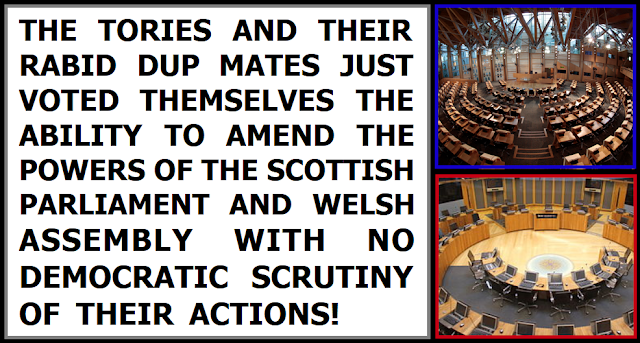 Amendment 158 sought to prevent the Westminster government from misusing the powers they were awarding themselves to amend EU derived laws in order to undermine the powers of the Scottish Parliament and the Welsh Assembly. This safeguard is vitally important because there are plenty in the Tory and DUP ranks who would dearly love to restrict the power of the devolved parliaments, if not scrap them altogether. All 13 of the Tory MPs representing Scottish seats voted with the government to let them keep the power to alter or revoke devolved powers from their own national parliament without any parliamentary scrutiny of what they are actually up to! 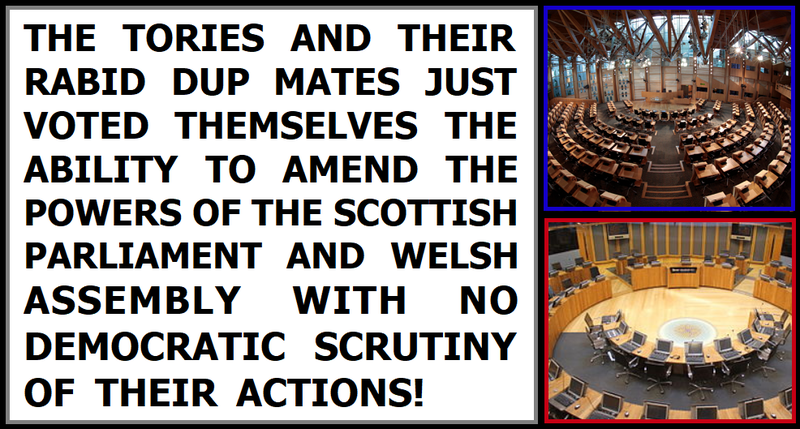 Unless you follow SNP or Plaid Cymru politicians on Twitter you will have heard very little about this vote because the mainstream media have decided to completely ignore it. Ignoring such a significant constitutional matter is bizarre enough in its own right, but this media silence is quite simply extraordinary given that this contentious vote occurred on the very same day that the entire corporate mainstream media erupted in an explosion of anti-Facebook fury over weeks old comments from a disgruntled former Facebook employee! The corporate media will go into a frenzy of churnalism over ex-employee attacks former employer comments from weeks ago, but not one of them will even bother to explain the details of the Brexit legislation the Tories are currently ramming through parliament with the support of their fanatical DUP backers/puppet-masters? If we look back to the whole debacle over English Votes for English Laws, the hypocrisy of the Tory party is truly revealed. They voted to ban Scottish Westminster MPs from voting on anything they define as an "English law", but when it comes to Brexit, they've voted to allow English government ministers to use Brexit as an excuse to redefine or even scrap the powers of the Scottish parliament! Of course a significant percentage of Brexit voters were the kind of hard-right tabloid-addled little Englanders who actually take Nigel Farage's ravings seriously, but a hefty percentage never were. 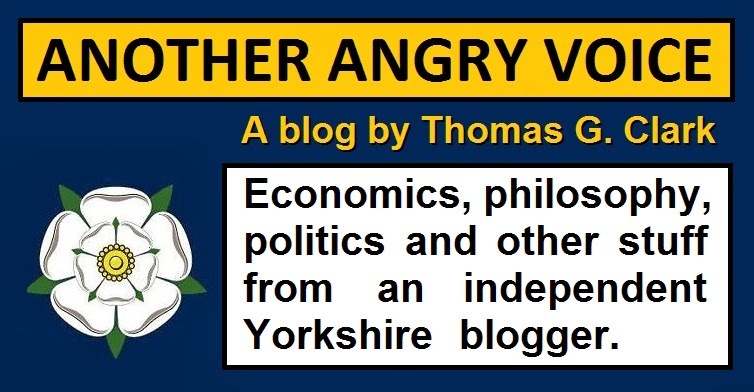 However it should be obvious to all by now that Brexit is being dictated by the hard-right fringe of the Tory party, and you couldn't really get a more callous and opportunistic bunch than that lot. If they see an opportunity to use Brexit as an excuse to reduce the political power of Scottish and Welsh voters then of course they're going to try to take it. Even if Brexit wasn't solely an exercise in anti-democratic Little Englanderism before the referendum result came in, this vote to scrap Amendment 158 shows that it certainly is now. The Tories are already determined to use Brexit as an excuse to rewrite thousands of UK laws with no democratic scrutiny whatever, and their vote against Amendment 158 is proof that they're keen on rewriting the laws that established and defined the devolved Scottish and Welsh parliaments, and doing that without any democratic scrutiny too. The direction of travel is absolutely obvious, and anyone (regardless of their views on the EU) who continues to support the profoundly anti-democratic and increasingly British-nationalist approach the Tories are taking to Brexit surely forfeits their right to consider themselves a supporter of democracy.